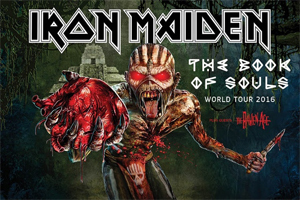 IRON MAIDEN Confirm Initial 2016 Dates For "The Book Of Souls World Tour"
The Book Of Souls World Tour will open in the US in late February with Ed Force One flying in for three shows before, in early March, heading into Central America visiting Mexico, followed by a first ever concert in El Salvador and a return to Costa Rica. Ed Force One then proceeds into South America for concerts in Argentina, Chile and a number of shows in Brazil before flying back to the USA at the end of March for ten more cities covering the USA and, of course, Canada in the first two weeks of April. Stay up to date with all IRON MAIDEN tour dates with HERE.